A robust humoral immune response to an Ag involves the generation of two populations of terminally differentiated B lymphocytes, that is, Ab-secreting cells (ASC) and memory B cells (1, 2). Mature naive B cells can give rise to short-lived ASC generated in response to thymus-independent (TI) or -dependent (TD) Ags in extrafollicular zones in secondary lymphoid organs. Short-lived ASC have half-lives of 2–3 d, proliferate, and secrete nonmutated IgM Abs. The immune response against TD Ags can also induce specialized structures in secondary lymphoid organs, termed germinal centers (GC). After immunization, GC generate long-lived ASC and memory B cells; the former do not proliferate, produce high-affinity Abs by somatic hypermutation (3), and undergo IgH class switch recombination (CSR) (4). Somatic hypermutation and CSR are dependent on expression of activation-induced cytidine deaminase (AID; aicda) (5). Long-lived ASC are located preferentially in bone marrow. Memory B cells express isotypes other than IgM after CSR, and they differentiate to ASC following Ag rechallenge (6). The initial steps of terminal B cell differentiation are characterized by the mutually exclusive expression of a zinc finger containing transcriptional repressors Bcl-6 and Blimp-1 (pdrm1) (7). Bcl-6 is expressed in GC B cells and is necessary for their formation. Bcl-6−/− mice have more ASC in T cell–dependent responses and secrete more Ig in T cell–independent responses, but they do not form GC structures (8). Bcl6 gene expression is regulated by the Irf4 transcription factor, a member of the IFN regulatory factor family, necessary for ASC differentiation and for CSR (9, 10). Irf4 is able to repress bcl6 expression by binding to its promoter region (11). Bcl-6 directly represses expression of the pdrm1 (Blimp-1) gene, at least in part by binding to a site in intron 5 (12, 13). Blimp-1 is needed for full ASC differentiation both in vitro and in vivo, although it is dispensable for the initial steps of ASC differentiation and for memory B cell generation (14, 15). Blimp-1 is sufficient to induce terminal B cell differentiation by directly repressing genes responsible for cell proliferation and B cell identity such as c-myc and pax5, respectively (16–18). Downregulation of pax5 expression initiates ASC differentiation by activating genes such as xbp1 that is needed for full ASC differentiation, and it promotes a series of molecular events that mediate Ig secretion (19, 20). Blimp-1 expression is normal in B cells lacking Xbp-1, suggesting that this factor acts downstream of Blimp-1 (19). Inhibition of c-myc expression by Blimp-1 terminates cell proliferation in ASC. A basic model was proposed in which Blimp-1 acts by direct repression of c-myc and pax5, therefore promoting xbp1 expression and Ig secretion (21). The c-Myc protein is a member of a basic region/helix-loop-helix/leucine zipper transcription factor family (N-, L-, and c-Myc) that regulates essential biological functions such as cell proliferation, differentiation, and apoptosis (22). c-Myc is broadly expressed and its deregulation has an enormous impact on human health; it is estimated that 50% of human cancers show altered c-myc expression (23). c-Myc is expressed in differentiating B lymphocytes and in mature B cells after activation (24). Transgenic mice that overexpress c-myc in B lymphocytes show abnormal B cell differentiation and rapid lymphoma development, leading ultimately to death (25). Mature B lymphocytes that lack c-Myc in vivo show severely impaired proliferation and resistance to apoptosis (26, 27). Involvement of c-Myc in differentiation has been described for several cell types, including myeloid cells and B lymphocytes (18, 28–30). c-Myc downregulation is associated with cell cycle arrest and terminal differentiation. In a mature B lymphoma line (17), repression of c-Myc is necessary but not sufficient to induce terminal B lymphocyte differentiation. Despite numerous reports on c-Myc function, little is known of the precise role of this protein in terminal B cell differentiation. In this study, we analyzed c-Myc function in terminal B cell differentiation in primary B lymphocytes in vivo. Our findings show that c-Myc is necessary for the generation of fully differentiated ASC, normal IgM secretion, and isotype switching. Moreover, c-Myc transcriptionally regulates the gene for AID (aicda) (5), linking cell proliferation and CSR. Finally, we found that the immune response to TI and TD Ags are largely Myc-dependent. Our results provide unexpected insights into c-Myc function in terminal B cell differentiation, and they show the importance of this transcription factor as a key effector of the humoral response. The generation of c-mycfl/fl (c-mycfl/fl;cd19cre/+;rosa26gfp/gfp) mice has been reported (26, 27). Six- to 8-wk-old mice were immunized i.p. with 200 μg 2,4,6-trinitrophenyl hapten (TNP)–keyhole limpet hemocyanin (KLH) (Biosearch Technologies) in aluminum hydroxide (Pierce) at a 1:1 ratio in 0.2 ml PBS. For the memory response, the same TNP-KLH dose was given 4 wk after the initial dose, and mice were analyzed 12 d after secondary immunization. For TI responses, mice received i.v. injections of 3 μg LPS (Sigma-Aldrich) and were analyzed 3 d later. Mice were bled weekly to obtain serum. 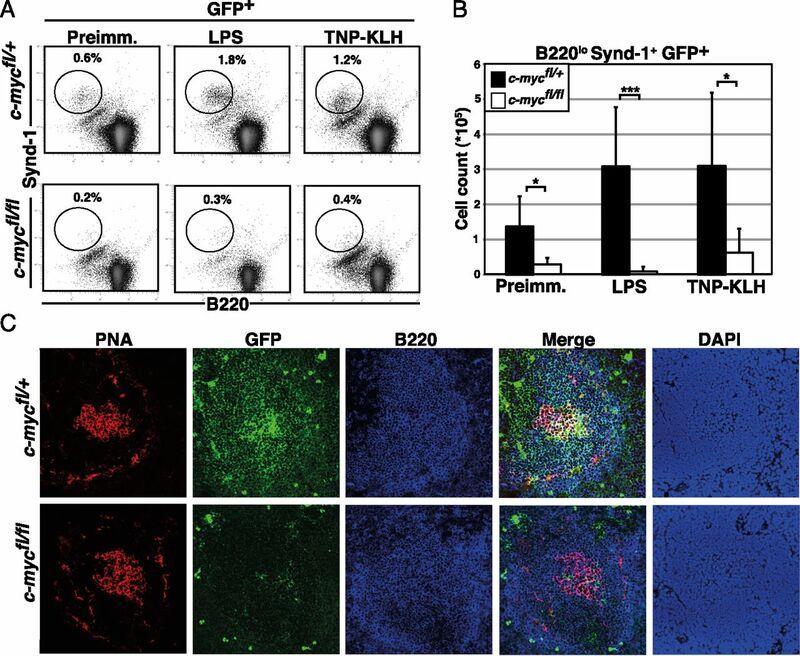 Single-cell suspensions were incubated in NH4Cl buffer to lyse erythrocytes and in Ab stained in PBS with 2% FBS. Abs used were from eBioscience (anti–B220-PE-Cy7, GL-7-biotin) and BD Pharmingen (B220-Pacific Blue, IgG1-PE, IgG3-PE, IgG2b-PE, IgE-PE, Gr-1-allophycocyanin, F4/80-allophycocyanin, IgD-Alexa 647, CD38-Alexa 700, CD23-PE, CD21-allophycocyanin, CD69-biotin, CD25-PE, CD138-biotin, and IgM-allophycocyanin). Biotinylated Abs were developed with streptavidin-PE or streptavidin-PE-Cy7 (BD Pharmingen). To detect TNP-specific memory B cells by flow cytometry, we used TNP-BSA-biotin (Biosearch Technologies); for intracellular staining, we used an IntraPrep kit (Beckman Coulter) and stained cells with anti–IgM-PE. We monitored cell proliferation with the CellTrace Violet cell proliferation kit (Invitrogen). Freshly isolated splenocytes were stained with anti–B220-PE-Cy7 in PBS with 2% FBS. B220+GFP+ cells were purified (>97% purity) on a FACSAria IIu sorter (BD Biosciences, San Jose CA). Sorted B lymphocytes were plated (105 cells/well) in RPMI 1640 medium with 15% FBS, 2-ME, and penicillin/streptomycin. TI-like stimulation was performed with 20 μg/ml LPS (Sigma-Aldrich), and TD-like stimulation was performed with 20 ng/ml IL-4 (R&D Systems) and 10 ng/ml anti-CD40 Ab (BD Pharmingen). Activated cells and supernatants were harvested after 1, 3, or 4 d in culture. Assays were performed following standard protocols using goat anti-mouse IgM Ab (SouthernBiotech). Anti–Igκ-HRP (HRP clone 187.1; SouthernBiotech) secondary Ab was developed with Sigmafast OPD (Sigma-Aldrich). For IgG1 and IgG2b, plates were coated with purified anti-Igκ and developed with specific biotinylated Abs for each isotype (BD Pharmingen). For IgE, plates were coated with purified anti-IgE, followed by biotinylated anti-IgE (SouthernBiotech). Plates were developed using streptavidin-HRP (BD Pharmingen). For detection of TNP-specific Abs, plates were coated with TNP-BSA (10 μg/ml; Biosearch Technologies) in PBS. Biotinylated anti-IgM (SouthernBiotech), IgG2a, or IgG1 (BD Pharmingen) were used as secondary Abs. For TNP-specific IgE, plates were coated with purified anti-IgE, and samples were incubated with TNP-BSA-biotin (Biosearch Technologies). Plates were coated with goat anti-mouse IgM (BD Pharmingen), washed, and triplicates of 3-fold serially diluted B220+GFP+ spleen cells were plated in RPMI 1640 with 1% FBS. Cells were incubated (37°C, overnight), then lysed, incubated (60 min, 37°C) with anti–Igκ-alkaline phosphatase (BD Pharmingen), and developed with 5-bromo-4-chloro-3-indolyl phosphate/AMP buffer (Sigma-Aldrich) in 3% low-melt agarose. The number of spots was counted from triplicates corresponding to two serial dilutions (six wells per sample) and the surface was measured with an AID ELISPOT reader and AID ELISPOT software (Autoimmun Diagnostika). Pooled supernatant from five wells (1 ml medium) was harvested 3 or 4 d after activation, and total secreted IgM was immunoprecipitated with goat anti-mouse IgM (BD Pharmingen). Remaining supernatant was immunoprecipitated again as a control. Ab-bound IgM was precipitated with Protein A/G PLUS-Agarose beads (Santa Cruz Biotechnology), washed in PBS with proteinase inhibitors, and bound protein was eluted (95°C). Supernatants were resolved in 10% SDS-PAGE and transferred to polyvinylidene difluoride membranes. Blots were incubated with HRP goat anti-mouse IgM (Sigma-Aldrich) and developed with Chemiluminiscence Reagent Plus (PerkinElmer). For spleen cryosections, mice were sacrificed 10 d after the second immunization. One-half of the spleen was snap-frozen in isopentane precooled in liquid nitrogen and stored at −80°C. Sections (10 μm) were prepared on a cryostat and acetone-fixed (room temperature, 10 min) before staining. For paraffin sections, half-spleens were fixed in 4% paraformaldehyde in PBS (room temperature, 2–3 h), followed by 70% ethanol (4°C, overnight). Sections (5 μm) were deparaffinized before H&E staining. Cryosections were blocked for endogenous peroxidase activity (70% methanol with 0.3% H2O2), for endogenous biotin (avidin/biotin blocking kit; Dako), and for nonspecific Ab binding (10% goat serum). Sections were stained with rabbit anti-GFP (ab290), rabbit anti-Cre Ab (Covance), monoclonal rat anti-mouse B220 (SouthernBiotech), biotinylated anti-MOMA1 (Dianova), and/or peanut agglutinin (PNA)-biotin (Vector Laboratories). Goat anti-rabbit IgG-HRP (Santa Cruz Biotechnology) and Cy5 mouse anti-rat IgG were used as secondary Abs. Sections were stained with tyramide-FITC (for HRP; PerkinElmer) and streptavidin-Cyn3 (Jackson ImmunoResearch). Slides were mounted in Vectashield with DAPI (Vector Laboratories) and images were acquired on a Olympus confocal microscope. Anti-CD40 plus IL-4–stimulated B220+syndecan-1−GFP+ and B220+syndecan-1+GFP+ cells were purified by cell sorting. Total RNA was extracted using the RNeasy Micro kit (Qiagen) and cDNA was generated with avian myeloblastosis virus reverse transcriptase using random hexamers (Promega). cDNA was used for real-time PCR with specific primers and internal probes for each gene in custom-designed TaqMan Express plates (Applied Biosystems). PCR was performed in an ABI Prism 7700 and results were analyzed with SDS software version 1.9. Relative gene expression was normalized to β-actin. Murine aicda regions were amplified by PCR using the following primers: for region 1 (R1), forward, 5′-GAAGATCTTGTGTCTCAGTATGTCATTCC-3′, reverse, 5′-ATGCCATGGGGAGCACATGCACAAGCAGAT-3′; for region 4 (R4), forward, 5′-GACGCGTGGAACTCTCTGTAACCTCGGGC-3′, reverse, 5′-CGACGCGTGCAAGGCAGCGAGGACAGAG-3′; for intron-1 (I1) region, forward, 5′-CGCGGATCCGACAGTGGAGAGACACAG-3′, reverse, 5′-CCGCTCGAGGGTAAGGAGGACTTTGCTAG-3′ cloned into the pGL3-control vector (Promega), up- or downstream of the luciferase gene, to generate the vectors pGL3-R1, pGL3-R1-R4, or pGL3-R1-R4-I1. All constructs were sequenced. For luciferase assays, M12 cells were cotransfected with 10 μg reporter or control vector, 2 μg pRL-TK.Renilla, and pRV-IRES-c-Myc-GFP expression vector. Activity was normalized to Renilla luciferase. At 18 h after transfection, firefly and Renilla activities were measured using the Dual-Luciferase reporter assay (Promega). For luciferase reporter assays in the P493.6 human B cell line, c-Myc was inhibited by adding tetracycline (1 μg/ml) after transfection. Experiments were performed according to the chromatin immunoprecipitation assay kit protocol (Active Motif). M12 cells were crosslinked with 1% formaldehyde and incubated (room temperature, 10 min). Rabbit polyclonal anti-c-Myc N262 Ab (sc-764; Santa Cruz Biotechnology) or preimmune serum was used to precipitate chromatin from 106 cells. Immunoprecipitated DNA and input samples were analyzed with the SYBR Green RT-PCR kit (Applied Biosystems), and percentage enrichment relative to the amount of input chromatin was determined as 2(Ct input − Ct Ab). Primers flanking E-box1 were AID.EB1, forward, 5′-GAGACCGCCAGCCCCTCA-3′, reverse, 5′-GCTGAGTTTTGGACATCTGG-3′. Primers for circle transcripts (CT) were: Iγ1, forward, 5′-TCGAGAAGCCTGAGGAATGT-3′, and Cμ, reverse, 5′-TGGTGCTGGGCAGGAAGT-3′. Statistical significance was determined with a two-tailed Student t test. To study the role of c-Myc in the generation of ASC and memory B lymphocytes in vivo, we used the c-mycfl/fl;cd19cre/+;rosa26gfp/gfp conditional mouse model (c-mycfl/fl hereafter). Briefly, c-mycfl/fl expresses the Cre recombinase under the cd19 endogenous promoter, deletes c-myc, and specifically activates the GFP reporter in B cells (26, 27). Terminal B lymphocyte differentiation can be mimicked in vitro by activation with TI or TD stimuli such as LPS or anti-CD40 plus IL-4, respectively. To determine whether c-Myc is necessary for the generation of terminally differentiated B cells, we isolated B220+GFP+ cells from spleens of c-mycfl/fl and control c-mycfl/+;cd19cre/+;rosa26gfp/gfp mice (c-mycfl/+) by cell sorting. Plasmablasts generated in vitro can be identified by the B220losyndecan-1+ surface phenotype (31). Flow cytometry analysis showed that after in vitro activation with LPS or anti-CD40 plus IL-4, c-Myc–deficient B lymphocytes did not generate B220losyndecan-1+ cells (c-mycfl/+ versus c-mycfl/fl, 7.4 versus 0.4% and 2.9 versus 0.1%, respectively; Fig. 1). Surface levels of the CD69 activation marker were similar in c-Myc–deficient B lymphocytes (GFP+) and in control cells (Supplemental Fig. 1A). c-Myc is needed for terminal B cell differentiation. (A and B) c-Myc is necessary for the generation of B220losyndecan-1+ cells in vitro. Sorted B220+GFP+ spleen cells from c-mycfl/fl and c-mycfl/+ mice were activated with LPS (A) or anti-CD40 plus IL-4 (B) and analyzed by flow cytometry 4 d later. For (A) and (B), we analyzed 12 mice per genotype, with similar results. c-Myc–deficient B lymphocytes show severely impaired cell proliferation as well as apoptosis resistance (26, 27). We observed consistent lack of proliferation in c-Myc–deficient B lymphocytes after in vitro stimulation with anti-CD40 plus IL-4 (Supplemental Fig. 1B). We concluded that these lymphocytes neither proliferate nor differentiate into B220losyndecan-1+ cells. Our data showed that c-Myc–deficient mature B lymphocytes were unable to generate the typical B220losyndecan-1+ cells. However, to determine whether functional ASC with an atypical surface phenotype may be generated upon activation, we measured the amount of IgM by ELISA in the supernatants of cultured cells; IgM levels were similar for mutant and control cells (Fig. 2A). ELISPOT quantification of ASC number in these cultures indicated an ∼6-fold decrease in total ASC per well for c-Myc–deficient B lymphocytes compared with controls (697.9 ± 335.6 versus 4396.4 ± 1006.2 ASC/well, respectively; Fig. 2B). c-Myc–deficient B lymphocytes thus generate fewer, although functional, IgM-secreting cells than do controls. c-Myc–deficient B lymphocytes hypersecrete IgM. 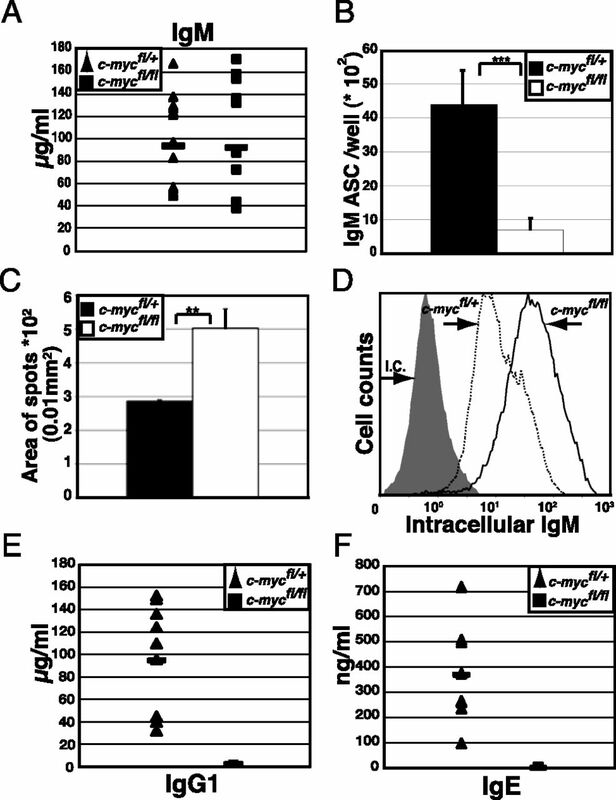 (A) IgM in supernatants from B lymphocyte cultures activated as in Fig. 1 B, quantified by ELISA at day 4. Sorted B220+GFP+ spleen cells were used (105; >97% purity) (c-mycfl/+, n = 14; c-mycfl/fl, n = 15; p = 0.3). (B) Number of IgM ASC per well quantified by ELISPOT (n = 9; ***p < 0.001). Sorted B220+GFP+ spleen cells were activated as in Fig. 1B for 3 d. (C) Mean area of spots of cells from (B). Triplicates from serial doubling dilutions (>200 spots) were counted (n = 3; **p < 0.01). (D) Intracellular IgM staining of B lymphocytes sorted and activated as in Fig. 1B. I.C., isotype control. Peak values are expressed as mean ± SD; c-mycfl/+, 20.26 ± 0.81 and c-mycfl/fl, 52.33 ± 8.82 (n = 3; **p < 0.01). (E and F) ELISA quantification of IgG1 (E) or IgE (F) in supernatants from cultures of B lymphocytes activated as in Fig. 1B (IgG1, n = 11; IgE, n = 7; p < 0.001). To account for similar IgM levels with fewer ASC, mutant B lymphocytes must secrete more IgM per cell and/or begin secreting earlier than control cells after stimulation. In ELISPOT, we observed comparable secretion kinetics by mutant and control ASC (Supplemental Fig. 1C). To analyze whether mutant ASC secreted more IgM per cell, we used several approaches. We measured the area of spots generated in the ELISPOT assay and found a 1.5-fold increase in spot area from c-Myc–deficient compared with control ASC (0.0502 ± 0.0058 versus 0.0286 ± 0.0004 mm2; Fig. 2C, Supplemental Fig. 1D). As c-Myc–deficient B lymphocyte cultures had 6-fold fewer ASC than did controls, and Ig levels in ELISA were similar in both cultures, average IgM secretion per ASC was 3-fold higher in mutant than in control cells (661.0 ± 55.9 versus 219.9 ± 19.7 μg/105 ASC; Supplemental Fig. 1E). 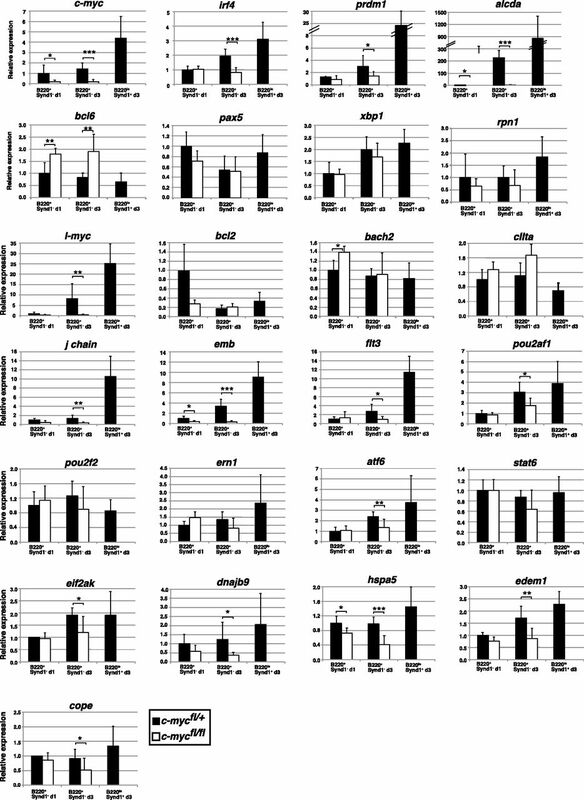 Consistent with these results, immunoprecipitation experiments indicated similar amounts of IgM in c-Myc–deficient and control B lymphocyte supernatants (Supplemental Fig. 1F). 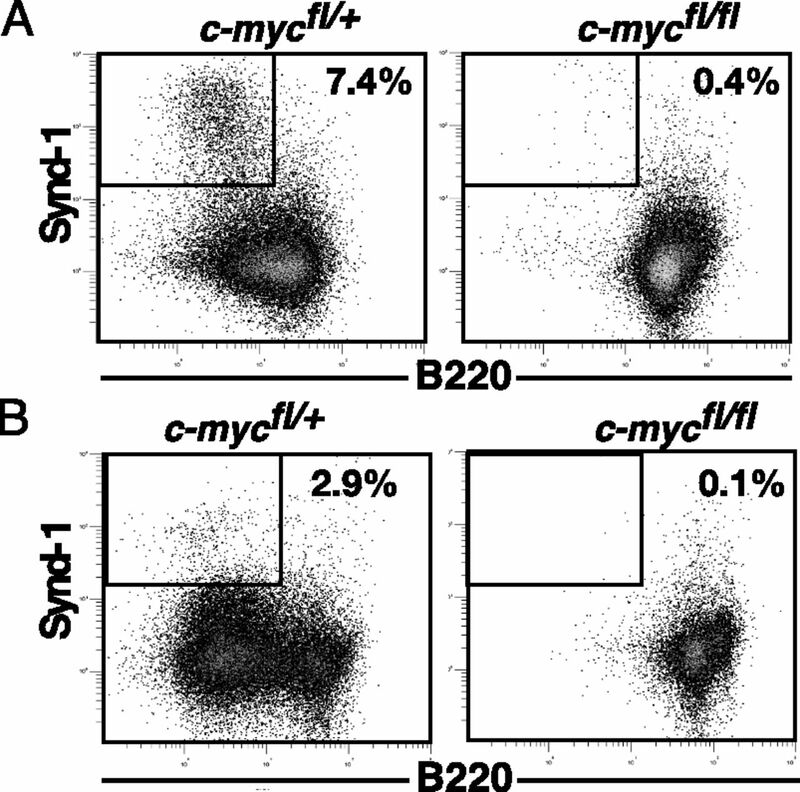 Finally, intracellular staining showed increased IgM in c-Myc–deficient compared with control B cells (Fig. 2D). Ig hypersecretion was restricted to IgM, as we detected no IgG1 or IgE in mutant cell culture supernatants by ELISA (Fig. 2E, 2F). Based on these data, we concluded that after in vitro stimulation, c-Myc–deficient ASC hypersecrete IgM and do not secrete IgG1 or IgE. We next examined the immune response against TD and TI Ags in the context of c-Myc deficiency. With this aim in mind, we immunized c-mycfl/fl and control mice with TD (TNP-KLH) or TI Ags (LPS) and analyzed them by flow cytometry. In our model, the GFP reporter identifies c-myc–deleted (GFP+) B cells that undergo Cre-mediated deletion. As observed in our in vitro results (Fig. 1), generation of spleen B220losyndecan-1+GFP+ ASC was impaired in c-mycfl/fl mice compared with controls after LPS (0.3 versus 1.8%) or TNP-KLH challenge (0.4 versus 1.2%) (Fig. 3A, 3B). As for spleen, c-mycfl/fl mouse bone marrow showed no long-lived ASC (Supplemental Fig. 2A, 2B). Serum anti-TNP Ab levels were similar in c-mycfl/fl and control mice, probably due to the presence of nondeleted B lymphocytes in the mutant mice (Supplemental Fig. 2C). c-Myc is therefore necessary for ASC generation during a TD or TI immune response. Naive B cells that arrive from bone marrow can home to specific areas in secondary lymphoid organs, and thus become marginal zone (MZ; CD23loCD21hi) or follicular (FO) B cells (CD23hiCD21lo) (32). We analyzed these populations in the spleen of c-mycfl/fl mice by flow cytometry and observed a decrease in absolute numbers of MZ and FO B cells in preimmunized and immunized c-mycfl/fl mice compared with control mice (MZ, 6.2 × 104 versus 2.4 × 105; FO, 3.5 × 105 versus 1.2 × 106 for immunized mice). In relative numbers, we also found an altered MZ/FO ratio in mutant mice (Supplemental Fig. 3A, 3B). In accordance with these data, immunohistochemistry sections showed the near absence of MZ B cells in c-mycfl/fl mice (Supplemental Fig. 3C–F). c-Myc–deficient B cells do not generate B220losyndecan-1+ cells or GC after immunization. (A) Flow cytometry analysis of B220losyndecan-1+GFP+ spleen cells from c-mycfl/fl and control mice immunized with LPS or TNP-KLH. (B) Absolute numbers of B220losyndecan-1+GFP+ cells in (A). Preimmune: c-mycfl/+, n = 6; c-mycfl/fl, n = 4 (*p < 0.05); LPS: c-mycfl/+, n = 6; c-mycfl/fl, n = 7 (***p < 0.001); TNP-KLH: c-mycfl/+ and c-mycfl/fl, n = 4 (*p < 0.05). (C) Immunofluorescence of spleen sections. PNA lectin was used to identify GC B cells and anti-GFP was used to detect c-Myc–deficient cells. Four to six spleen sections were analyzed per mouse (n = 6). Original magnification ×200. TD responses are characterized by the generation of GC in secondary lymphoid organs, which contain proliferating B cells that differentiate into ASC and/or memory B cells (33). c-Myc overexpression promotes the GC program in Burkitt’s lymphoma (34), a tumor caused by c-myc translocation. To test GC formation during a TD response in c-mycfl/fl mice, we analyzed spleen sections using PNA lectin to identify GC B cells (35) by immunofluorescence, and we found that c-mycfl/fl mice generated GC after TNP-KLH immunization. These GC nonetheless contained mostly B220+GFP- (nondeleted) or Cre− B cells (Fig. 3C and not shown). In accordance with this result, flow cytometry analysis of the GC marker GL-7 on the spleen cell surface showed a decrease in the B220+GL-7hiGFP+ cell population in TNP-KLH–immunized c-mycfl/fl mice compared with controls (0.3 versus 1.3%) (Supplemental Fig. 4A, 4B). These results are in agreement with recent work published by Calado et al. (36) where deletion of c-myc in GC B cells resulted in complete ablation of GCs in a T cell–dependent response and showed the requirement of c-Myc expression to maintain GC. We concluded that c-Myc–deficient GFP+ B cells do not generate GC in these mice, and thus c-Myc is needed for GC formation. To determine whether c-Myc was necessary for memory B cell generation, we studied the memory compartment in TNP-KLH–immunized c-mycfl/fl and control mice. Flow cytometry analysis, including the CD38 memory marker (37), showed a 26-fold decrease in the number of IgG1+TNP+CD38+GFP+ cells in spleens of c-mycfl/fl compared with control mice (Fig. 4). c-Myc is thus necessary for the generation of a normal memory B cell pool. c-Myc–deficient B cells do not generate memory B cells. (A) In immunized mice 12 d after a second TNP-KLH immunization, TNP-specific memory B cells from spleen were identified in flow cytometry. We excluded IgM+, IgD+, Gr-1+, F4/80+ cells (MIX) and stained for TNP-BSA and the indicated markers. (B) Absolute number of memory B cells (MIX−GFP+CD38+IgG1+TNP+) in (A) (n = 4; ***p < 0.001). To address the molecular mechanism by which c-Myc is affecting the activation of the transcriptional program involved in terminal B lymphocyte differentiation, we performed gene expression analysis by quantitative PCR (qPCR). With this aim, we isolated specific populations of activated B cells at different time points by cell sorting. Because c-Myc–deficient B lymphocytes do not generate B220losyndecan-1+GFP+ cells in vitro (Fig. 1), we compared the gene expression profile of B220+syndecan-1−GFP+ from c-mycfl/fl with B220losyndecan-1+GFP+ and B220+syndecan-1−GFP+ cells from control mice at days 1 and 3 after in vitro stimulation with anti-CD40 plus IL-4 (Fig. 5). Initiation of ASC differentiation is characterized by induction of the transcription factor Irf4, necessary for complete ASC differentiation (38, 39). In our experiments, irf4 remained at basal levels in mutant cells, whereas it showed a 3-fold increase in the transition from B220+syndecan-1−GFP+ to B220losyndecan-1+GFP+ control cells (Fig. 5). Generation of fully competent ASC requires activation of Blimp-1, which is partially inhibited by Bcl-6 (13). At day 3 after anti-CD40 plus IL-4 activation, c-Myc−deficient B220+syndecan-1−GFP+ cells showed 2-fold higher bcl6 levels and 3-fold lower pdrm1 (Blimp-1) expression than controls. Blimp-1 regulates pax5 (40) and this represses xbp1, a transcription factor involved in ASC differentiation and Ig secretion (19, 20). We found similar pax5 and xbp1 levels in c-Myc–deficient and control B cells (Fig. 5). Although ASC are classically considered nonproliferating cells, several reports show their capacity for in vitro and in vivo proliferation (41, 42). In our in vitro conditions, c-myc was induced in control cells, consistent with cell proliferation, whereas no aicda expression (5) was induced in c-Myc–deficient B lymphocytes (Fig. 5). Overall, c-Myc–deficient B cells resemble “preplasmablasts” (14), in which Blimp-1 expression is still low, Xbp-1 is expressed, and cells can secrete Ab (Fig. 5). Gene expression analysis of activated c-Myc–deficient B cells in vitro. Sorted B220+GFP+ spleen cells from c-myc fl/fl and c-mycfl/+ mice were activated with anti-CD40 plus IL-4 and resorted at days 1 and 3 to isolate B220+syndecan-1−GFP+ and/or B220losyndecan-1+GFP+ cells. Mutant cells did not generate B220losyndecan-1+GFP+ cells. Controls (filled columns) and mutant cells (open columns) are shown. RNA was prepared and qPCR performed (see Materials and Methods). Results were normalized to β-actin. (n = 6; ***p < 0.001, **p < 0.01, *p < 0.05). Ig class switch recombination (CSR) provides Abs with new effector functions by changing the IgM C region with a different C region of the IgH locus. One of the required factors for this process is AID (aicda) (4). The lack of aicda induction and the absence of Ig isotypes other than IgM in activated c-Myc–deficient B cell cultures prompted us to examine CSR in detail (Figs. 2E, 2F, 5). According to flow cytometry analyses, mutant B cells did not switch to IgG1 after in vitro stimulation with anti-CD40 plus IL-4 (Fig. 6A, 6B). Germline transcripts must be generated for normal CSR (4). The fact that Iγ1-Cγ1 germline transcripts were expressed at normal levels allowed us to test whether AID expression could restore CSR to IgG1 in c-Myc–deficient B cells (Fig. 6C). We thus bred c-mycfl/fl with a transgenic mouse that expresses aicda under the Ig κ regulatory elements (Igκ-AID mice) (43). The c-mycfl/fl;Igκ-AID mice generated B lymphocytes that delete c-myc and express ectopic aicda (Supplemental Fig. 4C, 4D). Flow cytometry showed that AID expression in c-Myc–deficient B lymphocytes was sufficient for IgG1 switching after in vitro anti-CD40 plus IL-4 treatment (Fig. 6A). CSR generates circular DNAs that originate specific transcripts (CT), a hallmark of active CSR (44). To confirm the flow cytometry results using a complementary technique (qPCR) we tested whether CSR correlated with the presence of γ1 CT (Iγ − Cμ) in B cells cultured from c-mycfl/fl;Igk-AID mice. We observed an ∼4-fold increase in γ1 CT transcripts in c-mycfl/fl;Igκ-AID compared with c-mycfl/fl mouse B lymphocytes (Fig. 6D). ELISA also showed a 6.8-fold increase in IgG1 levels in c-mycfl/fl;Igκ-AID culture supernatants compared with c-mycfl/fl controls (Fig. 6F). AID expression was therefore sufficient to induce CSR to IgG1 in activated c-Myc–deficient B lymphocytes. LPS activation of c-Myc–deficient B cells expressing ectopic AID led to only a slight IgG3 switch compared with controls (Supplemental Fig. 4E, 4F). 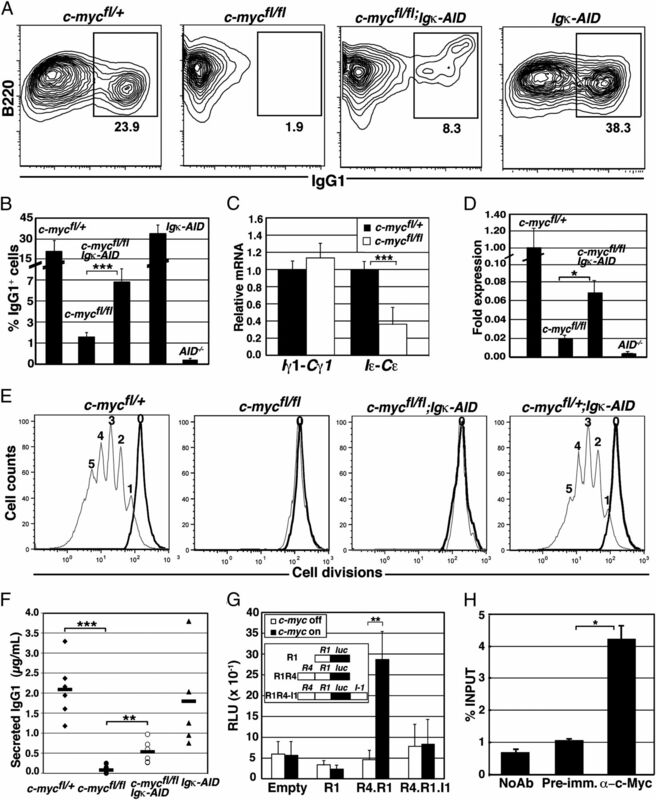 AID expression is sufficient to induce CSR to IgG1 in c-Myc–deficient B cells. (A) Flow cytometry analysis of sorted B220+GFP+ spleen cells from c-mycfl/fl, c-mycfl/+, and c-mycfl/fl;Igκ-AID and Igκ-AID mice activated with anti-CD40 plus IL-4. Cells were stained and analyzed at day 4 after activation. We analyzed seven mice per genotype, with similar results. (B) Relative numbers of IgG1+ cells in (A) (n = 7; ***p < 0.001). (C) qPCR of germline transcripts from cells sorted and activated as in (A) (n = 6; ***p < 0.001). (D) Detection of CT. Cells were sorted, activated as in (A), and analyzed by qPCR at 48 h. Specific primers were used to amplify Iγ1-Cμ transcripts (n = 3; *p < 0.05). (E) Number of cell divisions in activated B lymphocytes. Cells were isolated from spleens, stained with a cell tracer, and activated as in Fig. 6A. Flow cytometry was performed at day 4. Nonactivated cells at day 0 were measured as control (bold line). One representative experiment is shown (n = 3). (F) IgG1 in supernatants of cultured B cells activated as in (A) and measured by ELISA (n = 6; ***p < 0.001, **p < 0.01). (G) Luciferase reporter assays in the c-Myc–inducible human P493.6 B cell line. An outline is shown of the constructs tested. Values indicate mean ± SD (n = 3; **p < 0.01). (H) Chromatin immunoprecipitation in the M12 B cell line. Immunoprecipitation was performed with anti–c-Myc Ab or preimmune serum (control). Mean ± SD are shown (n = 3; *p < 0.05). Cell division number correlates with CSR (45) and with AID expression (46). B lymphocytes must undergo a number of cell divisions before CSR can take place (45). Our previous results (27) and cell counts in c-Myc–deficient B lymphocyte cultures suggested that proliferation is required for normal CSR (Supplemental Fig. 1B). We therefore monitored cell division by flow cytometry and observed that in contrast to control cells, c-Myc–deficient B lymphocytes did not undergo even a single division (Fig. 6E). These results suggest that cell proliferation is required for normal levels of CSR. The fact that AID expression was sufficient to induce CSR, although at low levels, in c-Myc–deficient B cells led us to test whether c-Myc transcriptionally regulates aicda. We screened the aicda genomic locus by computer analysis and identified a conserved putative c-Myc regulatory binding site (E-box) in both humans and mice within R4. R4 is located ∼10 kb upstream of the aicda promoter and has been defined as a cytokine response element that regulates aicda expression (47). Luciferase reporter assays in tetracycline-inducible, c-Myc-expressing human P493.6 B cells and in the murine M12 B cell line indicated that the aicda promoter alone (R1) was not induced by c-Myc. Nonetheless, use of a construct bearing R4 and R1 promoter regions led to c-Myc–dependent transactivation of aicda in both cell lines. A region located in I1 known for B cell specificity and aicda repression (48) consistently abolished c-Myc–dependent transactivation (Fig. 6G, Supplemental Fig. 4G). To test whether c-Myc binds to a genomic fragment containing R4, we performed chromatin immunoprecipitation and found 4-fold enrichment in amplification of genomic fragments containing R4 that were immunoprecipitated by anti–c-Myc Ab compared with preimmune sera (Fig. 6H). We conclude that c-Myc binds to R4 and transcriptionally regulates aicda. In this study we analyzed c-Myc function in terminal B lymphocyte differentiation of primary cells in vitro and in vivo by using a c-mycfl/fl mouse model that allows specific c-myc deletion in mature B lymphocytes. Additionally, this model allows GFP expression–based in vivo isolation and tracking of c-Myc–deficient B lymphocytes. We tested the c-Myc contribution to terminal B lymphocyte differentiation in different in vivo and in vitro settings. Our data identify c-Myc as a key regulator of not only the GC reaction but also of terminal B cell differentiation, and therefore of the humoral immune response. Our results show that c-Myc is needed for B lymphocyte differentiation into B220losyndecan-1+ cells after LPS or anti-CD40 plus IL-4 stimulation in vitro. c-Myc–deficient B cells did not downregulate B220 or express the ASC marker syndecan-1+ at the cell surface. Despite this apparent role of c-Myc in terminal B cell differentiation, the lack of cell proliferation in c-Myc–deficient B cells cannot rule out this process as the cause for this phenotype. Using various approaches, we found that despite this apparent lack of ASC phenotype, c-Myc–deficient B lymphocytes hypersecrete IgM. No significant changes were observed in expression of the tested genes involved in the unfolded protein response (20). Many hyper-IgM syndromes show CSR defects, and some involve altered AID expression (49). In our c-mycfl/fl mice, the lack of aicda could contribute to IgM hypersecretion, although the gene expression profile of c-Myc–deficient B cells argues for more complex c-Myc regulation. pdrm-1 (Blimp-1) is not induced at normal levels in these mutants, and the functional interplay between Irf4, Bcl-6, and Blimp-1 might be important in explaining this phenotype. The low irf4 levels observed in c-Myc–deficient B cells might be insufficient to repress Bcl-6. This, as well as the lack Irf4-dependent activation of Blimp-1 (38), would prevent full Blimp-1 induction and completion of the ASC differentiation program. Irf4−/− B cells do not become B220losyndecan-1+ and do not undergo CSR or generate GD (10), as also observed in our c-Myc–deficient B cells. Only ASC with very high Irf4 levels are able to induce Blimp-1 and fully differentiate into syndecan-1+ cells (39). We suggest a scenario in which c-Myc acts upstream of Irf4 to trigger the terminal B cell differentiation program. This possibility is supported by an observation from Shaffer et al. (50), who showed that c-Myc binds to I1 of irf4 and activates its expression in multiple myeloma and activated B cells. We examined the idea that c-myc repression is required but not sufficient for ASC differentiation (17) by distinguishing which specific events that lead to ASC generation can take place in the absence of c-Myc. We observed that IgM secretion occurs without proliferation, presumably due to normal expression of Xbp-1, whose levels are not affected by the lack of c-Myc. Alternatively, the low levels of Blimp-1 and Irf4 are likely contributing to create a “preplasmablast” (14) phenotype in secreting cells generated from c-Myc–deficient B cells. Consistent with our in vitro results, both TD and TI responses were severely compromised in c-mycfl/fl mice. c-Myc–deficient B lymphocytes have a severe impairment in the generation of B220losyndecan-1+ cells in response to immunization with either TNP-KLH or LPS. These results correlated with the pattern of expression of c-myc during the formation of GC as shown by Dominguez-Sola et al. (51). Serum analysis of immunized mice showed no significant differences between mutant and control mice for the isotypes tested. The most likely interpretation of this result is the presence of cells that have not undergone Cre-mediated deletion (wild-type cells). The memory pool after TNP-KLH rechallenge is severely reduced in c-mycfl/fl mice. We cannot rule out a potential c-Myc role in the differentiation of these cells; however, c-myc deletion can take place at any time during in vivo differentiation. Additionally, memory cells have undergone CSR. These characteristics support our idea that B cells have differentiated into memory B cells before c-myc deletion and that the lack of expansion/proliferation results almost in an undetectable number of cells. MZ B cells originate from an intermediate differentiation stage (transitional cells) by a cell fate decision between follicular and MZ cells (52). We observed a significant decrease in MZ c-Myc–deficient B cells, suggesting either dependence on proliferation to establish a normal MZ pool and/or the implication of c-Myc in balancing the MZ/FO ratio. In either case, c-Myc is needed for a normal MZ B cell compartment. This finding implicates c-Myc in the first stages of the B cell response to blood-borne encapsulated bacterial infections (innate-like immune response), before different isotypes other than IgM have been generated. Several reports suggest that CSR and cell proliferation are linked by an unknown mechanism involving AID (45, 46). The absence of cell proliferation and CSR in c-Myc–deficient B lymphocytes provided an ideal context in which to test the relationship between these two processes. Our data lead to several conclusions. First, in normal germline conditions, AID is sufficient to restore CSR in c-Myc–deficient B lymphocytes. Second, normal levels of CSR required cell proliferation, and thus give rise to only a small pool of switched cells. The differences in the capacity to restore switching to different isotypes upon AID ectopic expression could reflect additional c-Myc roles in B cells. These functions would affect, for example, the generation of specific germline transcripts and thus CSR. We next established direct transcriptional regulation of aicda and c-Myc in lymphoid cells by using reporter and chromatin immunoprecipitation assays; the induction kinetics of c-myc and gene expression support such an interaction. Moreover, there is a direct correlation between c-Myc and AID expression in GC as shown by Dominguez-Sola et al. (51). c-Myc could act as a physiological link between cell proliferation and CSR, although, as we have shown, these functions can be uncoupled mechanistically. We consider that the link between these two processes offers a mechanism that promotes expansion of Ag-specific switching cells and therefore a strong immune response. However, c-Myc is not only regulating CSR through modulation of AID expression. Our data strongly suggest that it is controlling other mechanisms that are essential for a full switching process. This points out the idea that AID does not need proliferation itself to promote CSR, but highlights the necessity of studying other c-Myc (in)direct target genes to explain the whole CSR process and its regulation. Using a number of criteria, we show that c-Myc regulates key processes of terminal B lymphocyte differentiation in primary B cells. Our data cannot rule out c-Myc–dependent cell proliferation as a major player in terminal differentiation. However, it is difficult to explain the phenotype relying on cell proliferation exclusively. The fact that c-Myc–deficient B cells generate IgM ASC could suggest additional roles of c-Myc. The gene expression profile with key regulators of terminal differentiation affected by the lack of c-Myc favor a more general role of this transcription factor. Either in reference to cell proliferation or to more specific functions, c-Myc emerges as a principal player in the generation of a normal, potent immune response. Finally, identifying the critical genes that control c-Myc–dependent proliferation is essential to characterize these functions in normal and pathological situations in B lymphocytes. We thank the Centro Nacional de Biotecnología animal facility, the Departamento de Inmunología y Oncología, C. Mark for editorial assistance, and J.M. Valpuesta for support. Igκ-AID mice were provided by M. Nussenzweig, and advice on ELISPOTs was provided by B. de Andrés and M.A.R. Marcos. M.O. and D.F. designed, performed, and analyzed the in vitro and in vivo experiments; L.R., A.G., and D.M. assisted in the flow cytometry experiments; and I.M.d.A. supervised the project, analyzed the data, and wrote the paper. This work was supported by grants from the Spanish Ministry of Science and Innovation, the Mutua Madrileña Foundation, the Concern Foundation, and the Regional Government of Madrid (to I.M.d.A.). M.O. was supported by a fellowship from the Regional Government of Madrid and the Fondo Social Europeo. D.F. received a fellowship from the Spanish Ministry of Science and Innovation.
. 2008. Plasma cell differentiation and survival. Curr. Opin. Immunol. 20: 162–169. 2008. Antibody diversification by somatic mutation: from Burnet onwards. Immunol. Cell Biol. 86: 124–132.
. 2004. Generation and maintenance of immunological memory. Semin. Immunol. 16: 323–333.
. 1994. Blimp-1, a novel zinc finger-containing protein that can drive the maturation of B lymphocytes into immunoglobulin-secreting cells. Cell 77: 297–306.
. 1997. The BCL-6 proto-oncogene controls germinal-centre formation and Th2-type inflammation. Nat. Genet. 16: 161–170.
. 1995. Molecular cloning of LSIRF, a lymphoid-specific member of the interferon regulatory factor family that binds the interferon-stimulated response element (ISRE). Nucleic Acids Res. 23: 2127–2136.
. 1997. Requirement for the transcription factor LSIRF/IRF4 for mature B and T lymphocyte function. Science 275: 540–543.
. 2007. A signaling pathway mediating downregulation of BCL6 in germinal center B cells is blocked by BCL6 gene alterations in B cell lymphoma. Cancer Cell 12: 280–292.
. 2000. BCL-6 represses genes that function in lymphocyte differentiation, inflammation, and cell cycle control. Immunity 13: 199–212.
. 2004. Direct repression of prdm1 by Bcl-6 inhibits plasmacytic differentiation. J. Immunol. 173: 1158–1165.
. 2007. Initiation of plasma-cell differentiation is independent of the transcription factor Blimp-1. Immunity 26: 555–566.
. 2003. Blimp-1 is required for the formation of immunoglobulin secreting plasma cells and pre-plasma memory B cells. Immunity 19: 607–620.
. 2002. Blimp-1-dependent repression of Pax-5 is required for differentiation of B cells to immunoglobulin M-secreting plasma cells. Mol. Cell. Biol. 22: 4771–4780.
. 2000. Repression of c-myc is necessary but not sufficient for terminal differentiation of B lymphocytes in vitro. Mol. Cell. Biol. 20: 8684–8695.
. 1997. Repression of c-myc transcription by Blimp-1, an inducer of terminal B cell differentiation. Science 276: 596–599.
. 2001. Plasma cell differentiation requires the transcription factor XBP-1. Nature 412: 300–307.
. 2008. Reflecting on 25 years with MYC. Nat. Rev. Cancer 8: 976–990.
. 1999. MYC oncogenes and human neoplastic disease. Oncogene 18: 3004–3016.
. 1990. Expression and function of myc family genes. Crit. Rev. Oncog. 2: 75–95.
. 1985. The c-myc oncogene driven by immunoglobulin enhancers induces lymphoid malignancy in transgenic mice. Nature 318: 533–538.
. 2004. c-Myc-deficient B lymphocytes are resistant to spontaneous and induced cell death. Cell Death Differ. 11: 61–68.
. 2001. Analysis of C-MYC function in normal cells via conditional gene-targeted mutation. Immunity 14: 45–55.
. 2002. The proto-oncogene c-myc in hematopoietic development and leukemogenesis. Oncogene 21: 3414–3421.
. 2011. B Lymphocyte commitment program is driven by the proto-oncogene c-Myc. J. Immunol. 186: 6726–6736.
. 2003. Myc represses differentiation-induced p21CIP1 expression via Miz-1-dependent interaction with the p21 core promoter. Oncogene 22: 351–360.
. 1989. B lymphocytes express and lose syndecan at specific stages of differentiation. Cell Regul. 1: 27–35.
. 2009. The follicular versus marginal zone B lymphocyte cell fate decision. Nat. Rev. Immunol. 9: 767–777.
. 2001. Germinal center reaction. Curr. Opin. Hematol. 8: 52–59.
. 2010. c-Myc overexpression promotes a germinal center-like program in Burkitt’s lymphoma. Oncogene 29: 888–897.
. 2006. Gene repression by Pax5 in B cells is essential for blood cell homeostasis and is reversed in plasma cells. Immunity 24: 269–281.
. 2004. Evidence from the generation of immunoglobulin G-secreting cells that stochastic mechanisms regulate lymphocyte differentiation. Nat. Immunol. 5: 55–63.
. 2005. Expression of activation-induced cytidine deaminase is regulated by cell division, providing a mechanistic basis for division-linked class switch recombination. Proc. Natl. Acad. Sci. USA 102: 13242–13247.
. 2010. B cell-specific and stimulation-responsive enhancers derepress Aicda by overcoming the effects of silencers. Nat. Immunol. 11: 148–154.
. 2003. The balance between Pax5 and Id2 activities is the key to AID gene expression. J. Exp. Med. 198: 1427–1437.
. 2010. Update on the hyper immunoglobulin M syndromes. Br. J. Haematol. 149: 167–180.
. 2008. IRF4 addiction in multiple myeloma. Nature 454: 226–231.
. 2012. The proto-oncogene MYC is required for selection in the germinal center and cyclic reentry. Nat. Immunol. 13: 1083–1091.
. 2005. Regulation of plasma-cell development. Nat. Rev. Immunol. 5: 230–242.